1. Usually, if I have more money and time, I take a trip. 2. If I have more money and time next month, I will take a trip. 3. If I had more money and time, I would/could take a trip. 4. If I had had more money and time, I would have taken a trip. Even if I had more money and time, I wouldn’t go on vacation. Even if I had more money and time, I couldn’t go on vacation. Even if you apologized, I couldn’t forgive you. I wouldn’t buy that sweater even if it were 50% off. I couldn’t buy that sweater even if it were 50% off. I wouldn’t tell you even if I knew the answer. I couldn’t tell you even if I knew the answer. She wouldn’t go to the party, even if she weren’t tired. She couldn’t go to the party, even if she weren’t tired. She would never forgive you, even if you apologized. She could never forgive you, even if you apologized. Even if I have more money and time, I don’t go on vacation. Even if I have more money and time, I can’t go on vacation. Even if you apologies, I won’t forgive you. I don’t want to buy that sweater, even if it is 50% off. I won’t tell you, even if I know the answer. I can’t tell you, even if I know the answer. She won’t go to the party, even if she isn’t tired. She will never forgive you, even if you apologize. You will do your homework, even if I have to force you to do it. He wants to breakup with his girlfriend, even if it means that he risks ending up alone for the rest of his life. She will tell him the truth, even if he might get angry. I am determined to buy that car, even if it costs me a fortune. You have to follow the company policy, even if you disagree with it. Even if you don’t like someone, you should be polite to them. It’s important to respect other cultures, even if you don’t completely understand them. I have to leave now, even if I don’t want to. He called her, even if she had told him not to. Even if I had had more money and time, I wouldn’t have gone on vacation. Even if I had had more money and time, I couldn’t have gone on vacation. Even if you had apologized, I couldn’t have forgiven you. I wouldn’t have bought that sweater even if it had been 50% off. I couldn’t have bought that sweater even if it had been 50% off. I wouldn’t have told you, even if I had known the answer. I couldn’t have told you, even if I had known the answer. She wouldn’t have gone to the party, even if she hadn’t been tired. She couldn’t have gone to the party, even if she hadn’t been tired. She would have never forgiven you, even if you had apologized. Thank you for reading until the end! 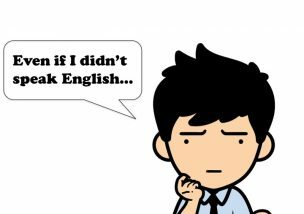 Enjoy learning English, even if you don’t use it everyday!